Do you know the benefits of statistical consulting? Statisticians have helped large businesses and organizations make decisions to guide programs and development for many years by studying trends and developing surveys that gather the right data. This is a resource that small communities and organizations need but typically can’t afford. The University of Minnesota Chapter of Statistics in the Community (STATCOM) can change that. 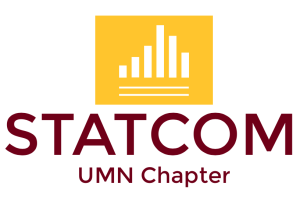 STATCOM is a student-run volunteer organization endorsed and supported by University of Minnesota’s School of Statistics. Its mission is to provide free statistical consulting to local non-profit, governmental, and community service organizations, by engaging students in voluntary, service-oriented statistical consulting and leadership. STATCOM will connect your group to a team of Master and PhD students or other volunteer statisticians who are mentored by professors in the School of Statistics and other departments within the University of Minnesota. STATCOM can assist your organization or community in making better decisions with data, designing surveys or experiments that get you the information you want, evaluate the effectiveness of programs or campaigns, or learn how to maximize resources. They have been involved with many great projects that have benefited a variety of organizations. To learn more about how to create a partnership with STATCOM visit their website.